Just a quick post to let you know that I listed this 8" x 10" painting on ebay last night. The background color was very hard to photograph, but the top picture is more true to the original. A white chocolate chip cupcake is piled high with piped green "Irish Cream" frosting and topped with miniature chocolate chips. Displayed on a black decorative cake plate and covered with a glass cloche, this cupcake will look great displayed for St. Patrick's Day or year round. 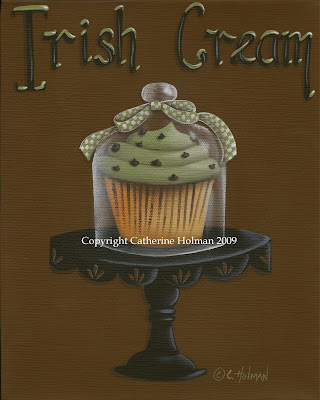 The black lettering at the top of the picture is dripping with green Irish cream icing and a green and white checked ribbon is tied around the knob on the glass cloche. My mother's side of the family is Irish and I've yet to find a four leaf clover. How about you? Do you have the luck of the Irish? That is cute and in perfect time for St. Paddies day! I am part Irish, and yes, I think I am pretty lucky! Hope you show me your finished mosaic project! Yummy painting, as always. I think that people are either four-leaf-clover-finders or they're not. I can spot them in a heartbeat, but the rest of my family can't find them to save their lives. So perfect for the holiday! No, I do not have the luck of the Irish. (Are we sure that the Irish are all that lucky? ;>) My grandmother's father's family is Irish so I have a wee bit of the Irish and I have yet to find a four-leaf clover. My sis, on the other hand, spots them all the time. Such a fun St. Patty's cupcake! I wonder why the brown was so hard to photograph. Isn't it funny how some colors do that? Yes, I do have the luck of the Irish on my mom's side, her maiden name was McManigle and my grandma's maiden name was O'Shea! The painting is sheer perfection and also so delicious looking. I must have some luck..I won some of your beautiful art AND I always find four leaf clovers when I look..and I am always stopping to look! lol My hubby loves pistachio cupcakes ...they are green, too! heehee! Sweet looking treat! Thank you for stopping in and for your well wishes, I am on the mend. I hope you have a wonderful weekend! 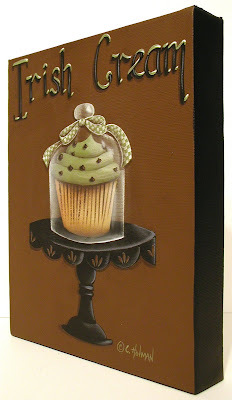 What a great cupcake painting for St. Patricks Day! Looks yummy. I've found lots of four leaf clovers! Neither my wife nor I have seen a four leaf clover in years. Of course, we don't spend as much time on the ground looking for them like we used to do when we were kids. I'm sure they are still there. Of course, with a little French on my side of the family and a little Russian on my wife's side, it probably take "Irish Eyes" to ferret out the good ones. I just realized that I never thanked you for the GORGEOUS Valentine's paintings that I ordered from you. I am so sorry. I absolutely adore them. They are displayed proudly in my kitchen on a little red child's chair that I hung up on the wall. They make me very happy! Also, thank you for the beautiful notecards. You were so kind to include them with my painting. You are so sweet. Be sure to stop by my blog before Thursday and say hello. I am having a little giveaway and I would love to include you in it! And yes, my husband and daughters are all Irish. My Mom's birthday is today, so that makes her Irish by birthday!